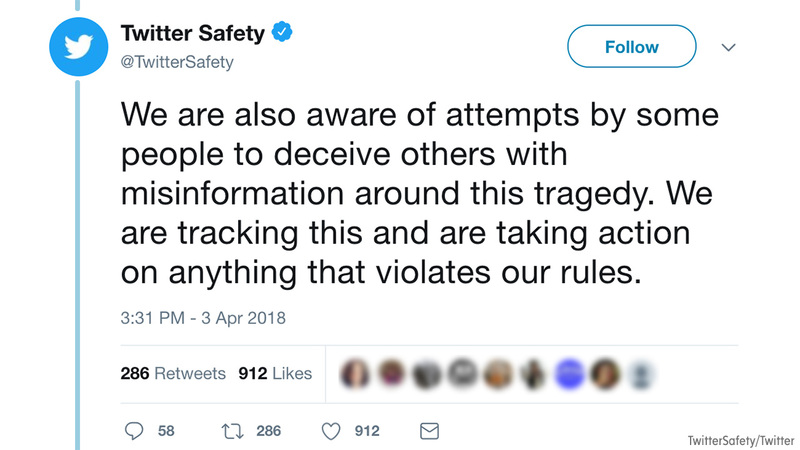 In the aftermath of the shooting at YouTube headquarters on April 3, Twitter said they are "aware of attempts by some people to deceive others with misinformation." The social media network vowed to take action against anything that violates their rules. We are also aware of attempts by some people to deceive others with misinformation around this tragedy. We are tracking this and are taking action on anything that violates our rules. Twitter said it could require users to delete tweets in emergency situations that could place someone in imminent danger. In emergency situations, we may require someone to delete a Tweet if it could place someone in imminent danger. Today’s shooting is one of those situations. Additionally, and as always, we will take action on content that intends to incite harm against a protected category or abuse others as outlined in our rules on hateful conduct and abusive behavior. Twitter spokesperson said to ABC News, "This is the approach we take during situations where misnaming someone could put those individuals in harm's way. There is more detail in our violent threats policy, specifically this section: 'We will not tolerate behavior that encourages or incites violence against a specific person or group of people. We also take action against content that glorifies acts of violence in a manner that may inspire others to replicate those violent acts and cause real offline danger, or where people were targeted because of their potential membership in a protected category.'"